It seems this diagram always provokes more criticisms. The last complaint is that there needs to be a line from Marxism (I assume via Michał Kalecki) to Post Keynesianism. However, the link to Marxism should not be exaggerated. Given that the LTV is the foundation of Marxist theory, it is obvious that Kalecki was a highly unconventional Marxist. 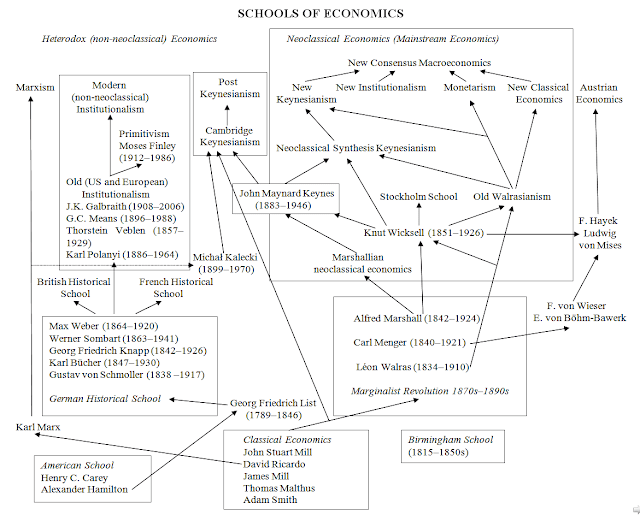 There is also a line that runs from Classical Economics to Post Keynesianism, owing to the influence of Piero Sraffa. I also had complaints about my placement of Karl Polanyi. In retrospect, I think he does belong with the Old (American and European) Institutionalists, and has been put there now. We do also have to remember that the Old Institutionalists did not all repudiate the neoclassical tradition, and many of them followed the Marshallian neoclassical tradition (Hodgson 2003: 463). Despite this, the Old Institutionalist school had impressive and considerable accomplishments: for example, the early work on administered prices/cost-based prices was done by Gardiner Means, an Old Institutionalist. A further offshoot of Old Institutionalism was the Primitivist tradition in ancient economics, the leading figures of which were Karl Polanyi (1886–1964) and Moses I. Finley (1912–1986). I have added Moses Finley and Primitivism. Moses Finley wrote a highly influential book on the economies of ancient Greece and Rome called The Ancient Economy (1973; rev. edn. 1999), which rejects many aspects of modern neoclassical economics and is firmly in the Old Institutionalist tradition (although some of Finley’s more extreme views are no longer held even by modern Institutionalists). I hope this satisfies people, because there’s no more room on the diagram. Finley, Moses I. 1973. The Ancient Economy (updated edn.). University of California Press, Berkeley. Finley, Moses I. 1999. The Ancient Economy (updated edn.). University of California Press, Berkeley. Hodgson, Geoffrey M. 2003. “Postwar Heterodox Economics: Institutional Economics,” in Warren J. Samuels, (ed.). A Companion to the History of Economic Thought. Blackwell, Malden, MA. 462–470. i think that kalecki influenced not by marxism but by karl marx (its different),also i think that karl marx used the LTV to be sort of make debunking classical economics. his use of classical economics i believe was more about anti capitalism than about strict believe in it (maybe i am wrong). but anyway its still legitimate to give marx credit as the insparation to kalecki. And of course he was committed to some kind of socialism (i.e. economic planning aiming at stable, usefull growth and fairer income distribution and to a large extent disregarding property "rights" when it comes to large companies), though not in a dogmatic (antireformist) manner. To my mind, there is the same kind of link between Marx and Kalecki as between say Leibniz and Russell : scientific progress... which almost allways implies rejection of some alledged "axioms" that happen to be mere dogmas : LTV in one case, internal relations principle in the other. BTW his "political aspects of full-employment"(1940?) still provide the best prediction / explanation of the 80's backlash I came to read. I agree with you about "Political Aspects of Full Employment." Michal Kalecki, "Selected Essays on Economic Planning." edited by Jan Toporowski. Cambridge University Press, 1986. Jerzy Osiatynski, "Michal Kalecki on a Socialist Economy." The Macmillan Press, Ltd., 1988. I don't know how to classify Kalecki but I know that the authorities in socialist Poland considered Kalecki to be an "incomplete Marxist" because he did not conform to the more dogmatic approach to economics favored by the government leadership. Thank you a lot for those references TG. I will look into it. Soviet "marxism" has the same kind of link with genuine marxian research as spencerian social "darwinism" with the teory of evolution through natural selection. Well you know my criticism. I think there should be a link from J. K. Galbraith to Post-Keynesianism, since he did indeed identify with and publish in the Journal of Post Keynesian Economics. Also Gunnar Myrdal was interesting. He also influenced a bit of heterodox economists, especially Nicholas Kaldor, but also modern day ones like Ha-joon Chang. 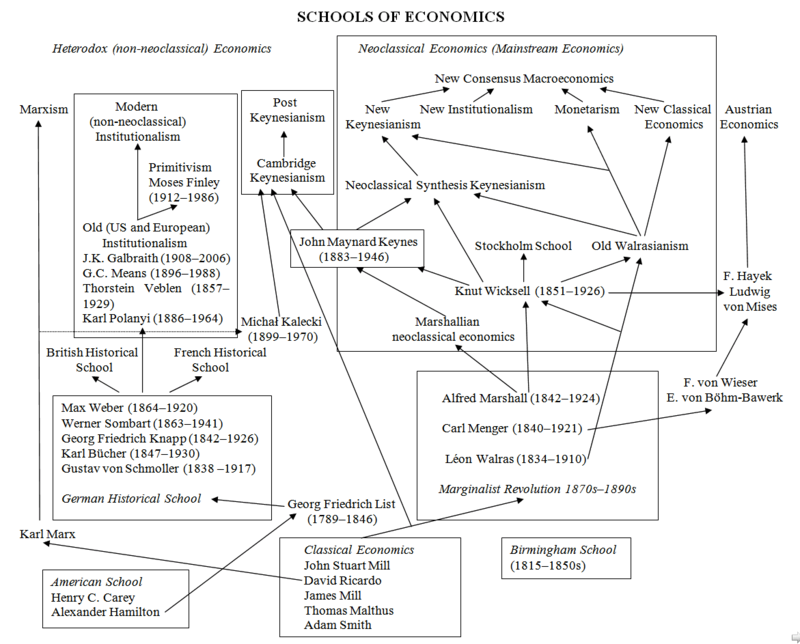 Didn't the German Historical school have an influence on the Austrian school? I mean I know Max Weber had an influence on Mises but what about others?